The VENTCARE INC. robot designed for inspection and cleaning acoustic lined and metallic ducts is unique within our industry and is of our patented design. The robot's features allow us to adjust the intensity of the cleaning action and monitor the cleaning process with the remote mounted camera system. 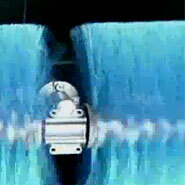 As a result we are able to adjust the robot's cleaning function to gently remove the particulate from the acoustic lined ducts without damaging the surface integrity of the lining, or intensify the cleaning action in the metallic duct to remove the heavy accumulations of insects or caked on mud. The VENTCARE INC. robotic direct contact brushing method, contacts the ductwork on all four sides simultaneously, providing a work method that ensures particulate removal of a quality superior to traditional compressed air and hand vacuuming. 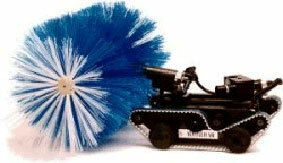 These brushes, render the interior surface of ductwork to its original clean, smooth condition. This method ensures quality particulate removal with minimum access damage. The VENTCARE INC. cleaning system and equipment cover these basic areas. In addition we can offer the following tangible benefits. The VENTCARE INC. robotics, minimize the number of access holes made in the ventilation system. This preserves the mechanical integrity of the ventilation duct system. In addition access to ductwork traditionally felt inaccessible is now possible, e.g. ductwork blocked or hidden by electrical cable trays; ductwork where the workplace is restricted (hospital operating rooms etc.). It is our objective to improve the indoor air quality, by increasing the quality and quantity of air supplied by the ventilation system.